This year i.e. in 2018 Shaheed Bhai Taroo Singh Ji's martyrdom day is being observed on July 16 all over the world. This gruesome incident took place 273 years ago. This brave and dauntless Sikh was born in a Sandhu Jatt famly in Puhla village which at that time fell in District Kasur (now in Pakistan) but now falls in Distt. Tarn Taran of Punjab. In his sacred memory at the place of his birth stands Gurdwara Janam Asthan Shaheed Bhai Taroo Singh Ji. 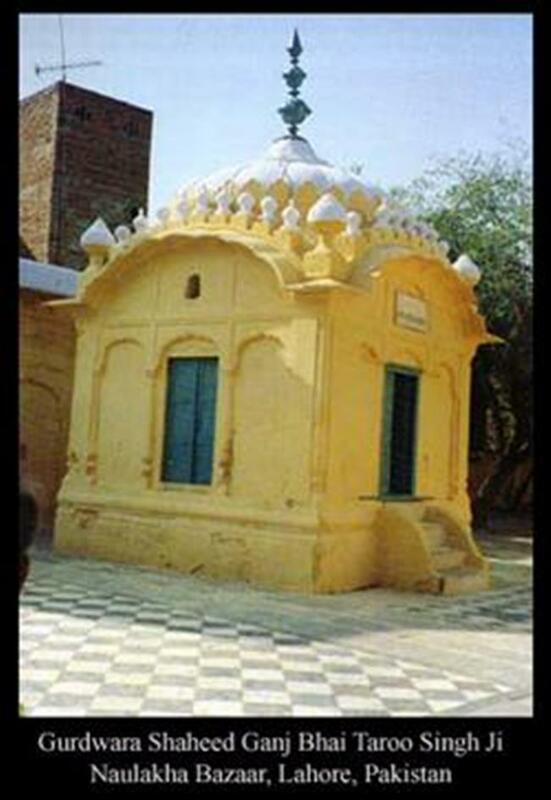 "The site of martyrdom of Bhai Taru Singh Ji is located in the Naulakha Bazaar. This Bazaar starts from the end of Landa Bazaar and runs upto Lahore Railway Station. Once you enter Naulakha Bazaar from Landa Bazaar there is a small door on the left hand side in between shops. The door carries this inscription: "Gurdwara Shaheed Ganj Bhai Taru Ji". His martyrdom was part of a staunch policy of the Mughal rulers in the 18th century to convert all non-muslims to Islam and thereby extinguish Sikhs. As part of this staunch policy Bhai Taroo Singh Ji was arrested in June 1745 and after torturing him in thousands of inhuman ways, was martyred on July 1, 1745 in Lahore in a very torturous way by scrapping his scalp off his head with a rambi (a shoemaker's scraper). This gruesome happening took place as part of the staunch policy of Mughal rulers wherein prices were fixed on Sikh's heads. During this unforgettable dark period in Sikh history, the Mughal rulers had fixed Rs. 10 as a reward to anyone giving information which could lead to the arrest of a Sikh and Rs. 50 for bringing the head of a Sikh. The whole set-up of machinery of the government was oriented towards seizing the property of the Sikhs, crushing them and killing them. The high-ups in the government would go on 'Sikh hunting expeditions' and send cartloads of heads of Sikhs to Lahore. It was during this gloomy time that (i) Bhai Bota Singh Ji and Bhai Garja Singh Ji were killed in an encounter (ii) Bhai Shahbaz Singh Ji and his father Bhai Subeg Singh Ji were tied to the death wheel around which knives were fixed, the wheel was turned which crushed their bodies into small pieces. In the following years many other such cruel incidents followed. Bhai Taroo Singh Ji was an agriculturist by occupation. Whatever grains he produced were cooked by his mother and sister and the cooked food was supplied to the Sikhs who had been driven into exile because of persecution. As stated in Prachin Panth Parkash by Rattan Singh Bhangu, in June 1745 Zakriya Khan who was the governor of Lahore during 1726-1745, one day asked his men, "From where do the Sikhs obtain their nourishment? I have debarred them from all occupations. They realize no taxes. They do not farm, nor are they allowed to do business or join public employment. I have stopped all offerings to their gurdwaras. No provisions or supplies are accessible to them. Why do they not die of sheer starvation." Harbhagat Niranjania of Niranjania sect also known as Mahant Narayan of village Jandiala who was a government informer and staunch enemy of the Sikhs answered as follows, "There are Sikhs in this world who would not eat until they have fed their brethren. They may themselves go without food and clothing, but cannot bear their comrades' distress. They would pass the winter by fireside and send them their own clothes. They would sweat to grind corn and have it sent to them. They would do the roughest chore to earn a small wage for their sake. They migrate to distant places to eke out money for their brothers in exile." "In the village of Puhla in Majha" continued Harbhagat, "lives one Taru Singh. He tills his land and pays the revenue to the officials. He eats but little and sends what he saves to his brothers in the jungle. His mother and sister both toil and grind to make a living. They eat sparingly and wear the coarsest homespun clothes. Whatever they save, they pass on to the Sikhs." Thus Harbhagat Niranjania who had received many rewards from Mughal rulers for killing Sikhs also became responsible for Bhai Taroo Singh Ji's martyrdom. As a result of what Harbhagat Niranjania told Zakriya Khan Bhai Taroo Singh Ji who was of barely 25 years of age was immediately arrested and produced before Zakriya Khan. When he was produced before Zakriya Khan he dauntlessly greeted him with the Sikh salutation, 'Vahiguru Ji Ka Khalsa Vahiguru Ji Ki Fateh.' He was charged with sedition. As Rattan Singh Bhangu has stated Bhai Taroo Singh Ji calmly asked, "If we till your land, we pay the revenue. If we engage in commerce, we pay taxes. What is left after our payments to you is for our bellies. What we save from our mouths, we give to our brethren. We take nothing from you. Why then do you punish us?" Zakriya Khan became enraged and pronounced that he should either embrace Islam or face death. As Rattan Singh Bhangu has stated Taroo Singh Ji calmly asked, "Why must I become a Mussalman? Do not the Mussalmans ever die?" Zakriya Khan became enraged and pronounced the usual punishment i.e. death. Zakriya Khan asked the executioner to remove the hair of Bhai Taroo Singh Ji. But Bhai Taroo Singh Ji said that my hair are the amanat (anything entrusted for safe custody) of my Guru and hence you cannot separate them from my skull. Thus Zakriya Khan asked the executioner to remove his skull with a rambi (a shoemaker's scraper). Thus the qudi the court law-giver announced the verdict of a torturous death by scrapping the scalp off his head. During June 1745 Bhai Taroo Singh Ji was tortured in multifarious ways and finally martyred on July 1, 1745. He thus proved that for a Sikh hair are more precious than his life. When the executioner was removing his scalp Bhai Taroo Singh Ji was reciting Japuji Sahib's paath. Bhai Taru Ji belonged to Polah, a village of District Kasur, he worked with his own hands to bring up his family and to serve the Singhs of the Guru and looked after the Sikhs. Mahant Narayan lodged a complaint against him that he was harbouring dacoits. He was arrested and put to torture in thousands of ways. At last orders were issued to behead him. Bhai Sahib faced the death heroically and kept reciting the Japuji Sahib. He was beheaded on 23rd Assu, Samvat 1802 (1745 AD). The devotees built his Shaheed Ganj at this site (place of martyrdom). There are many shops in the name of Gurdwara and an estate worth Rs. 100 per annum is granted to it since the Sikh period. It was maintained by the Gurdwara Parbandhak Committee from 1927 to 1947. Its maintenance was entrusted to Bhai Achchar Singh who later became Jathedar of Akal Takht Sahib. Evacuee Trust Board has taken over the charge now". Qaiser's words indicate the exact date and site of martyrdom of Bhai Taroo Singh Ji and bear testimony to the fact that Shaheed Bhai Taroo Singh Ji was tortured "in thousands of ways". The Gurdwara Shaheed Ganj Bhai Taroo Singh Ji situated in Landa Bazar, Lahore is a place of pilgrimage for the Sikhs. Zakriya Khan, the torturer governor himself died on the same day i.e. July 1, 1745 at Lahore a few hours before the death of Bhai Taroo Singh Ji. (v) Sohan Lal Suri in his book Umdatut Twarikh (vi) Cunninghamn in his book A History of the Sikhs, Zakriya Khan died a few hours before Bhai Taroo Singh Ji because of a severe attack of a disease which had stopped his urine. Only July 1, 1745 at the same time when Bhai Taroo Singh Ji was martyred Bhai Matab Singh Ji also known as Bhai Mehtab Ji who accompanied by Bhai Sukha Singh Ji had killed Massa Ranghar who had converted the holy precincts of Sri Darbar Sahib into a smoking, drinking and dancing place, was martyred by breaking him on the wheels, wherein he was tied to the death wheel around which knives were fixed, the wheel was turned which crushed his body into small pieces. Zakriya Khan left this world a dispirited man without achieving his aim of vanquishing Sikhs and leaving his sons and successors in utter chaos and confusion. Bhai Taroo Singh Ji's martyrdom sounds a note of warning for all Sikhs that for them retaining of hair is more precious than life itself. For all times to come Sikh community will remember Shaheed Bhai Taroo Singh Ji with deep respect and remain indebted to him for showing the Sikhi Marg (true path) to them.